This facial for all skin types and geared to your own specific needs. 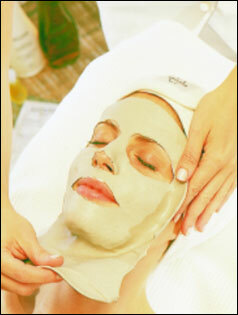 The facial includes a full cleanse, skin analysis, exfoliation, steam, extractions and mask. This facial address the specific needs, which commonly affect a young skin (Up to 19 years of age). For the hard to reach area of the back. This treatment helps to thoroughly cleanse and clear congested pores by a deep cleansing and exfoliation steam, and extraction if necessary; followed a back massage and moisturizing lotion. Specialized to sooth the irritated skin due to shaving and sun damage. This treatment consits of a deep cleanse, exfoliate, hot towels, massage and mask. The skin is left feeling smooth and hydrated.